Yesterday (Wednesday March 27th) Bitcoin confirmed 383k transactions, the highest it's been in 12 months. Bitcoin transactions have risen to year highs on Wednesday, as the technology is being used more as ease of access increases. March 28th saw 383,186 transactions confirmed on the Bitcoin blockchain, a record for the past 12 months according to data from Blockchain.com. Bitcoin is also trading slightly above the key $4k level now at $4,100. "Remarkable Growth In User Transaction Volume"
We all know there are a growing list of reasons to long Bitcoin, from a technology stand-point and as a hedge against fiat inflation as the US debt is sky rocketing, now at over 22 Trillion dollars and with falling bond yields. 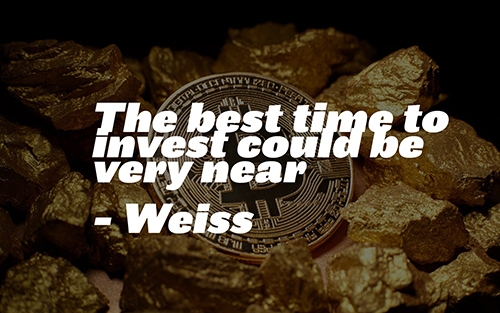 Financial ratings firm Weiss said 'the best time to invest could be very near" citing the "remarkable growth in user transaction volume"
With reports like these and companies like BlockFi offering 6% annual interest on their Bitcoin savers accounts, for people who plan to hold their positions for the long haul. Once all the coins are mined, there wont be anymore. 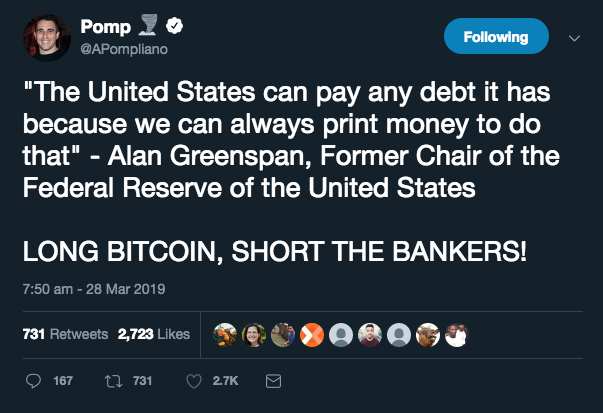 At a limited supply of 21 million, that's not even enough to have 1 BTC per person in one country. Bitcoin is created by mining, the block rewards are getting smaller and smaller each time there is a halving. The next halving will be in 2020, and could see Bitcoins price appreciate towards $50,000 based on projections made by Analysts Plan B. Ultimately having a limited supply, and huge demand world over for the technology means the value of Bitcoin will grow as more people begin to use it and understand what it can do for them. Search volume is very low, and whilst most have heard about it in a general sense - they are yet to use it and do not understand the practical value yet, as adoption just hasn't been the spectacle they are expecting. The payment solution that's been developed to ensure transactions go through lightning fast, so purchasing a coffee or paying for a download is instant - is very much becoming a reality. 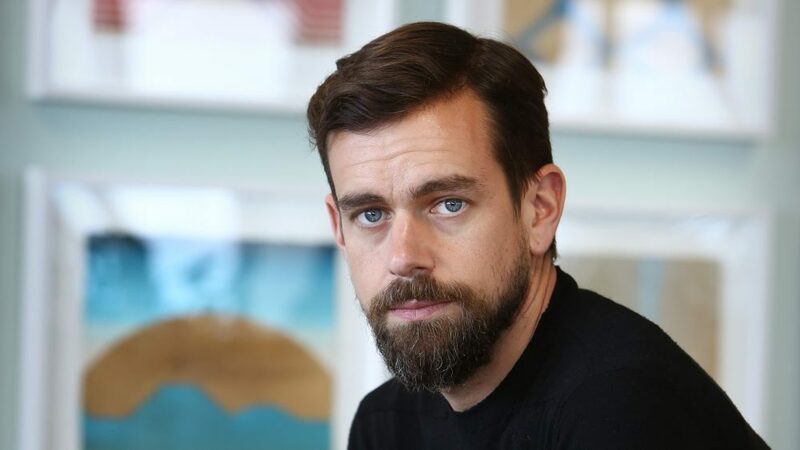 Jack Dorsey, Twitter CEO — has now taken the lightning torch and begun integrating the protocol on Square's hugely popular Cash.app, saying that the matter is "when, not if"
Anthony Pompliano, founder of Morgan Creek Capital, an investment house with $1.5 billion under management — suggested that Smith's Food & Drug stores should deploy the Lightning Network in response to their decision to drop VISA, and now according to his tweets, the negotiations have already started. Malta-based Zebpay is now the first crypto exchange to launch Lightning network support, customers can pay using lightning network to make instant in-store transactions. Rather then using cash, customers can just pay with their smartphone, allowing up to 10 transactions a day for 1 satoshi. 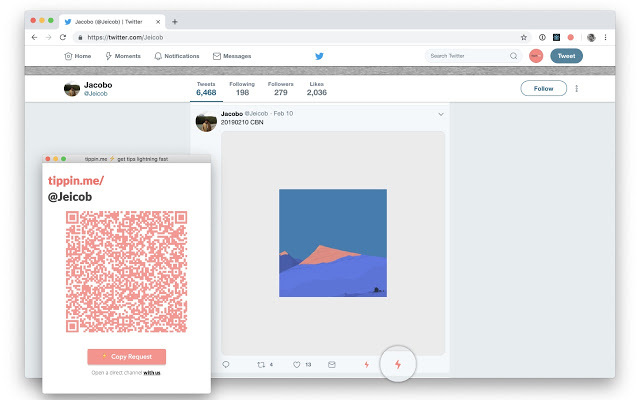 Last month Tippin.me the lightning enabled tipping app for twitter was released and enables you to simply send a tip to a tweet you liked, via a Chrome extension. As the lightning network grows in size and finds more areas of adoption, we can be sure to see transaction volume increase as more people start using Bitcoin in their everyday lives. Not sure how to get Bitcoin? Buy Bitcoin with your VISA or Mastercard today!